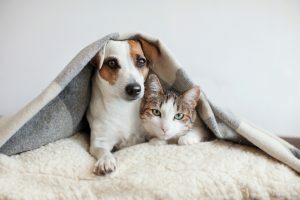 The holiday season is just around the corner and, during the hustle and bustle, it’s easy to let your guard down when it comes to keeping your pets away from toxic exposures. From holiday foods to decorations, everyday items around your home you wouldn’t think twice about can quickly become a threat to your furry friends. That said, here are some of the most common holiday toxins that are recommended to keep away from your pets. Pet owners may not be as concerned about holiday decorations as they are with food or alcohol. Yet, certain holiday decorations can be choking hazards and may also contain poisonous chemicals. For example, old-fashioned bubble lights contain methylene chloride. This chemical can cause irritation to the skin, eyes, and gastrointestinal tract. It can also cause aspiration pneumonia. Make sure to keep ornaments and other decorations up and out of your pet’s reach to keep them from biting or playing with them. As mentioned above, many pet owners are aware of the dangers of holiday foods around their pets such as chocolate and other sweets. Chocolate and cocoa can cause vomiting, diarrhea, seizures, and heart issues. Still, other holiday foods such as grapes, raisins, and currants that may be in breads, fruit cakes, or cookies can cause kidney failure in dogs should they ingest them. You may have heard that poinsettia plants are toxic to pets. This is true, but poinsettias are only mildly toxic. Holiday plants such as holly, mistletoe, and lilies are more dangerous to your pets. Lilies, including their pollen and water, can cause kidney failure in cats. Holly can cause gastrointestinal issues in both cats and dogs, and mistletoe can cause seizures and hypotension. Keep toxic plants in mind while you’re looking for holiday bouquets for your home or celebration. If you’re unsure if a plant is toxic, talk to your local florists for more information. Up to 54% of customers at florist shops buy decorations for entertaining, like centerpieces, during the holiday season. But it can be challenging to find holiday bouquets that are also pet-friendly. Whether you’re looking for holiday flower arrangements for entertaining or for that extra bit of color around your home, Open Blooms have the holiday flowers you need. To learn more about out holiday bouquets and other flowers that are pet-friendly, contact Open Blooms today.